Figure: DFT analysis of NPc on NaCl(5 ML). Scientists from the University of Liverpool are part of an international research team that, for the first time, has measured charging levels of single molecules on insulators. In a paper published in the journal, Nature Nanotechnology, a team of scientists from the University, IBM and University of Regensburg used a brand new approach to charging a molecule on an insulator. They first grew multi layers of NaCl, also known as sodium chloride or salt, to act as an insulating material, on top of a metal substrate. Such a system allows for adsorbed molecules to have their charge states stabilised and decoupled from the metal surface. The team then developed and investigated a new approach that allowed measuring charge reorganisation energies of individual molecules on top of the insulator. 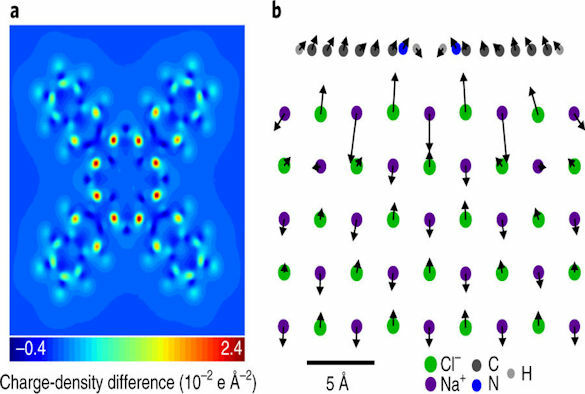 They used noncontact atomic force microscopy (AFM) to probe single electron transfer between the AFM tip and well-defined charge states of a single napthalocyanine molecule in both directions to test the method. This enabled them to measure energy levels of different charge states of a single, adsorbed molecule on top of an ultra thin insulator with single electron sensitivity. IBM physicist, Leo Gross, lead author of the paper, added: “With our AFM method, we measured the energy levels in both charge state change directions on a thin film substrate. But it’s incredibly demanding work that deals with very weak signals, meaning many careful measurements are needed to perform proper statistical analysis. The finding represents a big step forward for single molecule electronics and its application spans from characterisations of defects in chips, to photovoltaics and organic semiconductors. The paper ‘Reorganization energy upon charging a single molecule on an insulator measured by atomic force microscopy’ is published in Nature nanotechnology (doi: 10.1038/s41565-018-0087-1). Here’s Dr Leo Gross from IBM Research explaining the science.